During the Cold War, one of the battlefields was the oceans of the world. On its surface as well as underneath it, ships from the United States and the former Soviet Union jockeyed for position to eliminate their targets the instance they received the dreaded word from their superiors to launch their horrific weapons. Submarines played a pivotal role in this deadly game as they carried a large portion of these destructive aresnals. Ballistic missile submarines often carried these weapons while smaller submarines, called fast attack boats, guarded them from their opposite number. Sometimes, ballistic missile submarines would travel on their own in the belief that they would allow them a quiet transit throughout the ocean. The Delta II was a class of ballistic missile submarine created by the Soviet Union. Created between 1973 and 1975, the Soviet Navy designed it as an improvement on the previous Delta Is in terms of ballistic missiles carried. They normally carried sixteen SLBMs in their silos as well as a complement torpedoes that they could launch through four to six torpedo tubes. Powered by two nuclear reactors, which gave a top speed of 24 knots, they could remain at sea almost indefinitely. The Delta submarines also had double hulls, which allowed them to break through the icecaps of the Arctic and fire their nuclear missiles. It also had a potential possibility of allowing Deltas to take torpedo hits and survive. Four Delta IIs were confirmed built. 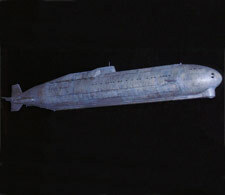 One such submarine was patrolling to the south of Japan during the summer of 1984. Suddenly they spotted an unidentified object that seemed to be following them. After attempting to outmaneuver the object, the captain ordered the sub to general quarters. Within seconds, it launched two torpedoes at the object with both finding their mark. At first, the captain and his executive officer thought that the target had been one of the new American Los Angeles class attack submarines. However, to their shock and horror, the object remained intact and before anyone could react, the gigantic mass rapidly tore into them. The crew had only a few seconds before they lost their lives by drowning or by an enormous explosion. When they first heard the loss of their submarine, the Soviet Union immediately blamed the United States. A nuclear war was nearly inevitable when Japan's Prime Minister Mitamura revealed the true culprit, who was none other than Godzilla. Shortly afterwards, the Soviet Union stated that they had lost the sub along with the lives onboard, that they deserved to participate in the fight against Godzilla even if it meant using nuclear weapons. However, Mitamura silenced the idea almost immediately and soon convinced the Soviets as well as the Americans to allow Japan to fight Godzilla the way it felt was best.